Few months ago, the auctioneer Christie’s brought us for examination this magnificent representation of a Parisian behind vibrantly coloured posters. Painted by Jean-Louis Forain in the 1880s, it offers a perfect overview of the habits of the artist, the great chronicler of Parisian life at the Belle Epoque. Check out what Christie’s has to say on this standout painting! Forain’s La femme aux affiches offers a brief glimpse into the artist’s personal experiences of travelling through the bustling streets of Paris during the early years of the Belle Époque, as flashes of modernity began to dramatically alter the very fabric of the city and its identity. A regular contributor to the contemporary journals and news outlets of his day, Forain earned a reputation throughout Paris as an insightful and satirical illustrator, unafraid to take aim at the prevailing social codes and habits of the city’s well-to-do inhabitants. Demonstrating an acute ability for capturing the subtle nuances of class and etiquette that colored even the most prosaic of interactions, Forain became an astute chronicler of the gradually shifting social and power structures of the period, as traditional boundaries between the classes began to disappear. A keen observer of life, Forain slipped easily into the role of the typical flâneur, absorbing the city’s sights and sounds, experiencing its play of life first-hand, using the numerous scenes of la vie Parisienne that he encountered while strolling along the capital’s boulevards as the primary inspiration for his compositions. 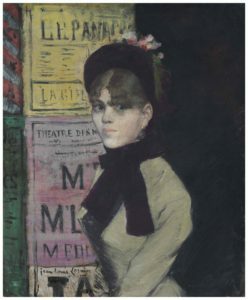 In La femme aux affiches, Forain immortalizes one of these fleeting encounters, painting a portrait of one of the fashionable young women who populated the city’s boulevards as they went about their daily business. This anonymous lady, elegantly dressed in a rich plum-colored hat adorned with flowers and ribbons, stares straight out at the viewer, her large, almond shaped eyes drawing us in to her world and holding our gaze, despite the bright colors and bold graphics of the posters which adorn the newsstand behind her. Capturing the varying textures and details of her costume with the briefest of brushstrokes, from the play of light on the sleeve of her dress to the intricate design of her earring, Forain illustrates the importance of fashion and appearance in the lives of these young women, while also perhaps casting a critical eye on the changing role of clothing as a means of identifying social status during this period. Indeed, there is a certain ambiguity as to his subject’s identity—this young woman might be a well-to-do middle-class figure out for a day’s shopping, or perhaps an aspiring actress or ballet dancer on her way to an audition, or even an enterprising sales assistant from one of the city’s glamorous department stores. As such, she remains a figure of mystery, an enigmatic, elegant woman who briefly captured Forain’s attention, and through the power of her gaze, left an indelible impression on the artist’s memory. Galerie Paul Rosenberg, Paris (by 1917). Lieutenant-Colonel Rosander, Stockholm (acquired at the above sale). M. Knoedler & Co., Inc., New York (acquired from the above, 1937). Abby Aldrich Rockefeller and John D. Rockefeller, Jr., New York (acquired from the above, July 1937). Laurance Spelman Rockefeller, New York (gift from the above, June 1947). Acquired from the estate of the above by the late owner, February 2005.